I was listening to the radio tonight as Barack Obama spoke from the Lincoln Memorial, commemorating the speech by Martin Luther King given there ten years or so ago. At least it seems like ten years ago. Twenty at the outside. But they said it was fifty years. 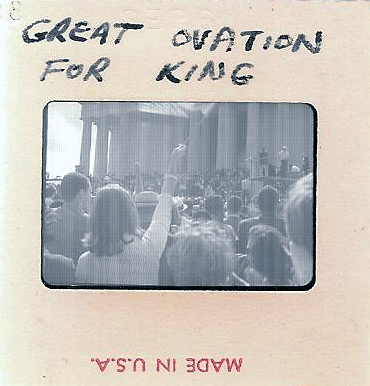 Fifty years since Martin Luther King stood at the Lincoln Memorial and gave that speech about his dream. On the radio tonight some fellow was interviewed, a black activist who was there at the time, and they asked him if he thought then, when he was there, that it was a great speech. And he said no, not particularly. I know that a lot of people thought that about the Gettysburg Address and they probably thought that about Pericles' Funeral Oration too. It can take time for greatness to sink in. But as for me, I was standing there that day listening to Martin Luther King talk about his dream, and I tell you that his dream was a magnificent speech on that day. So many people, everybody listening, everything so quiet, like a great prayer. I thought the whole world was going to move that day. After listening to that radio broadcast tonight I remembered that I took some colour photographs that day, 28 August 1963, as I marched with a quarter of a million people through Washington DC to the Lincoln Memorial. After some searching I have dug them out. This is the first time I have seen them in maybe all that time, in maybe fifty years. I thought I would mark the day by posting the photographs on this blog; then I realised that they are transparencies and my scanner does not scan transparencies. But I have read online - see here - of a way of scanning transparencies with an ordinary flatbed scanner. And so I cut out my piece of paper and made my isosceles triangle and stood it like a tent on top of my colour transparencies and actually got a result. But I could not get a result in colour. So you will have to put up with grey. And why not? A bit of improvised verité to mark the day. 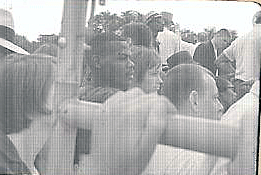 Maybe tomorrow I will get these transparencies put on a CD and I will upload them again and you will see them in colour, and I will be able to enlarge them in parts, and you will see, as I see in my memory, that Martin Luther King's great dream speech is not history; for those who were there it will always be today. I have scanned these colour transparencies by primitive means, but that will have to do for the moment. 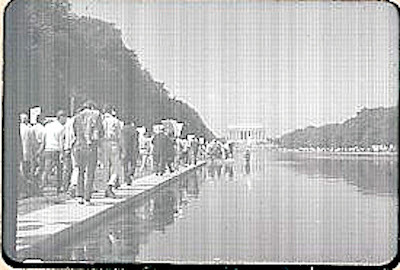 Here you see the march approaching the Lincoln Memorial, one marcher in the water. 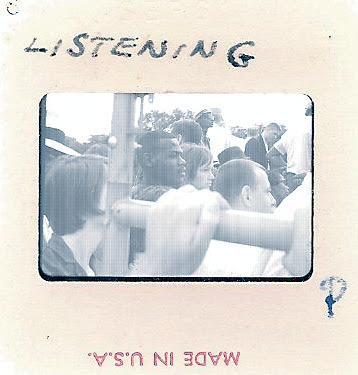 I added captions to the transparencies at the time. Listening. A quarter of a million people quiet and listening as Martin Luther King spoke of his dream. It was a restrained, quiet, civil and intensely moving day.